I'm not sure when exactly it happens, but there is a day post-parenthood that you open your mouth and your mom comes out! The 1st time I noticed it, I giggled to myself and then realized my mom had a few great sayings that I have carried forward into my own parenting. I have compiled a list below, gathered from my mom and the moms of those close to me, in no particular order. Would love to hear your top mom-faves too! It's less about words and more about actions. You can pick your nose and you can pick your friends, but you can't pick your family. Give more to your community than you take from it. Before making a decision, do the newspaper check...would you be proud to have your decision/action on the front page of tomorrow's newspaper. No matter who comes in and out of your life, always stay true to yourself. Things are much more enjoyable when you have earned them. Drink lots of water and use moisturizer daily. Be a person that builds others up, not one that tears them down. Always tell your loved ones how much they mean to you, even when they drive you crazy. Smile at people, it's a free gift that goes a very long way. People who seem the least lovable, need the love the most. Always have your own money. When you feel alone chat with God. Find the positive, it could always be worse. 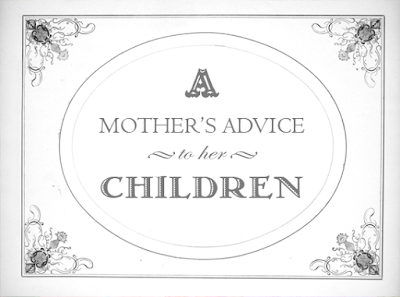 Visit our Pinterest Board for more fun mom advice. Do you ever feel like you have turned into your parents? I feel like I lived so many years with my parents warning me that life goes by so fast, yet yearning to reach the next milestone, that seemed in the moment to take forever! It was just recently that I 'got it'. Yep, life flies by at warp speed and if you don't take just a moment to take it in, you will miss the beauty. Just yesterday, I was feeling overwhelmed, a little like life was flying by, and I was too exhausted to take it in. It was at 1:00am, as I sat up still working, that I looked out our back window, overlooking a peaceful lake, and took just a moment to remember that this life is short-term. I guess we all fight this internal battle between enjoying all life has to offer, while also juggling the responsibilities that propel us forward. I LOVE what I do, but at times feel like I am drowning in it just a bit. There's the designing, the selling, the managing, the running a growing business...then there are the kids, the hubby, dinner to be made, tennis lessons to go to. Oh and did I mention, we are about to put our house on the market?? So much to do, so many hours working, but then I must take a moment to remember how blessed I really am. I am certainly not the only parent trying to 'do it all', so I know you can likely relate. It's funny, I now find myself reminding my 4-yr old daughter to enjoy every age, to take it all in, cause "life goes by fast". I guess my parents were right all along, with age comes wisdom. As I age, and the dark circles become more prominent, the wrinkles become a little deeper, and those darn grey hairs are just hanging out at the surface laughing at me a little each day. I take it all in stride because there is nothing more rewarding, more valuable than understanding and truly appreciating that each day, each week as a gift from God. I may not do each of those days perfectly, and I certainly have a TON to learn, but there is something freeing about living life for your own beliefs, values and achievements, over the expectations of others. Pushing myself everyday, yet understanding the value in my priorities. Life does go by fast and although I may drown in it a bit, the adventure is mighty fun! Do you ever think back on a particular food that reminds you of your childhood? I do, one in particular - Thea Anna's pudding dessert. This sweet was a staple at birthday parties, cookouts, holidays, ect. Thea means aunt in Greek, but is also commonly used out of respect with non family members. While Thea Anna and I are not blood related, she is no doubt my second mother. I spent almost as much time in her home as my own growing up, and her two daughters and I think of each other as sisters. Our mothers are best friends and together we make up one big fat happy Greek family! Both Thea Anna and my mother have an unusual affinity towards extreme cleanliness, so as children we were encouraged to play with toys that couldn't cause detrimental damage to walls/carpets/furniture/decorative pieces/ect. We stuck to relatively mess-free play - riding bikes, Barbie dolls, hide and seek, ect. This meant that crafts and cooking were out of the question - these activities posed too high of a risk to cause destruction to our homes. Don't get me wrong, I love them for it! And despite the play restrictions we are all creative in our own right, can cook edible food, and are incredibly clean. So when asked to write a creative kid friendly blog, I was at a complete loss. That is until Thea Anna's pudding dessert came to mind. It tastes amazing, is super easy to make, and above all is kid friendly. To verify this point I recruited a family member's child to help me make it. She told me that she had fun - so it is in fact kid approved!